I love mexican food. Really really reeeeeally love it. We have a Mexican restaurant in walking distance from our home, which is awesome for spontaneous Mexican food cravings, but *not* so good for my waistline or wallet, so i’m always looking for ways to make my favorite dishes at home. I’ve successfully tackled homemade tortillas, chicken tortilla soup, chicken flautas + spicy chicken quesadillas, so i figured it was time to try making the number one thing I order at mexican restaurants: enchiladas. Last week, when my husband + I were wanting Mexican food + planning to go to the restaurant up the street, I asked him if he’d try homemade enchiladas at home instead. He was game, so I got cookin’. And the results? Holy moly, these are AMAZING! My husband said that they fill his craving just as well as dine-out Mexican does – no small feat. They’re so good that we’ve made them twice in 7 days. Although they look like a cheese-heavy, calorie-filled dish, the simple chipotle + spice sauce has just a little oil + flour, no butter, + a relatively small amount of cheese. You definitely won’t guess these are “healithier” – they taste just as decadent + delicious as traditional enchiladas. So, next time you’re looking for healthier, lighter, delicious homemade enchiladas, give these a try! if using uncooked chicken breasts: in a large skillet with a tight-fitting lid, bring 1 inch salted water to a boil. add chicken. cover; reduce heat to medium-low. simmer 5 minutes; remove skillet from heat. let chicken steam, covered, until opaque throughout, 12 to 14 minutes. transfer chicken to a medium bowl; shred with two forks. set aside. if using cooked rotisserie chicken: shred both the white meat + the dark meat of the rotisserie chicken, put in a medium-sized bowl + set aside. while chicken is cooking, make sauce: in a medium saucepan, heat oil over medium. add garlic; cook until fragrant, 1 minute. add flour, cumin, chili powder, + chipotles in adobo; cook, whisking, 1 minute. whisk in broth + 1/2 cup water; bring to a boil. reduce to a simmer, + cook, whisking occasionally, until sauce has thickened slightly, 5 to 8 minutes; season with salt + pepper to taste. transfer 1 cup sauce to bowl with chicken; toss to combine. preheat oven to 400 degrees. pour 1/4 cup sauce into bottom of an 8-inch square baking dish; set aside. stack tortillas, + wrap in a double layer of damp paper towels; microwave until hot, about 1 minute. fill each tortilla with chicken mixture; roll up tightly, + arrange, seam side down, in baking dish. cover with remaining sauce, + top with cheese. bake until hot + bubbling, 15 to 20 minutes. let cool 5 minutes before serving. Great minds think alike! I like the chipotle in your version – I need to add that to mine next time. LOVE it! We eat a ton of Mexican in our house. Brandon really loves it, and I’m starting to find how much I love it, too! I also love how easy a lot of Mexican dishes can be to make. This one looks awesome! YES! This is right up my alley! Annnnnnnnnnd, I love that they are a “lighter” version and that they use chipotles in adobo. I’m going to make these next week, for sure! Yum. lighter mexican food is always ALWAYS something I’m down for! these look delicious!! especially with that addition of chipotle. i love some heat every once in a while. I am OBSESSED with enchiladas; seriously, it’s bad. I always think that I should be making/eating a lighter version, so this is perfect. Thank you my dear! amy….these look fabulous!! I think you just read my mind because I was thinking about making this dish very soon. I’m definitely interested in trying a lighter version. Thanks for sharing the recipe. This is definitely my speed. Going to have to put the tortillas and cheese on the grocery list. I have everything else! Thanks for sharing, it looks fabulous! kelly + steph, make sure you report back – i’d love to hear what you think of ’em! I’m almost always in the mood for Mexican! Love this. I’ve only made enchiladas once but definitely need to again. Love the idea of some lighter Mexican treats – gives me an excuse to indulge all the more often! i am always down for lightened up comfort food. enchiladas are a favorite, too! Oh yum – you use chipotle! I love that idea. We make enchiladas at home at least once every 6 weeks or so, but it’s always so hard to lighten them up. I love that you’ve cut the fat of extra cheese, red meat, & butter in the sauce. I love even more the spice blend you chose in addition to delish chipotles. This recipe is bookmarked. Great idea as usual, Amy – thank you! I make homemade tortillas too! And I love that you added Chipotle in Adobo to this. Beautiful. I love chicken enchiladas that are made at home. This is the perfect dish to make when we have half of a chicken left over. I can make just half of the recipe. I can tell already it’s a holy moly as you said. I was seriously just craving some cheesy goodness! This will definitely hit the spot, and I am absolutely thrilled that there’s chipotle in here! I miss so much a proper Mexican meal! In California there are plenty of Mexican restaurants to choose from (but not so popular in UK! )… I should follow your example Amy, I’ll make my own Mexican food at home! I’ve been making enchiladas for years but never tried my own sauce…yours looks divine. This looks SO CHEESY and perfect. Oh I would SO eat all of this standing over the stove with a fork. I’ve never done that…ha ha ha. i confess, i did the exact same thing before serving it to my husband a few minutes later. it looked too good to wait! I think I could live on mexican food alone. Chips and salsa, check! Now I need me some enchiladas for din din! Amy, you come up with the best recipes. This is totally brilliant and it looks so delicious! Definitely worth a try in my kitchen… Thanks, darlin! oh my goodness…this recipe looks so yummy! Bookmarked! This is what I like to call “Mexi-CAN” food. Versus the nasty stuff…Mexi-CAN’T. 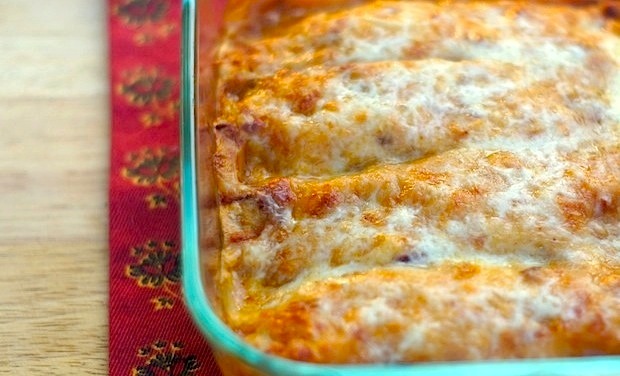 These enchiladas look delicious! We love Mexican food and often eat at “Chipotle”. I need to make this at home. Sounds like a very simple and yum recipe! Ohhhhh I love enchiladas. I gave up buying cheese and meat for Lent (almost done!! ), so these are especially tempting to me tonight. Hi! New to your blog, but had to come visit after we wrote pretty much the exact same comment on Avid Appetite! Its hard to find good Mexican food in India. Your enchiladas look great and lip smacking good. Will try this soon. ooooh yes–i prefer Mexican food at home and this sounds PERFECT! The only thing better than enchiladas are LIGHT ENCHILADAS. Salvating! Thanks for the recipe, girlie! (And for absolving my guilt!)! your mouth will thank you later! woohoo, i love it when people have success with recipes from my blog. so glad you guys liked these as much as we did! Big chicken enchilada lover myself. I pinned this recipe onto my healthy eating board and definitely going to try it. Thanks Amy. Ames…Hubby loved this..said he’d much prefer this over our staple Mexican dish…tacos. Thanks, as always, for the super yummy and even better, super easy recipe!! that’s awesome to hear! it’s one of our favorite at-home mexican meals, too – so easy, so delicious!